My coral reef aquarium was an Oceanic 180 gallon (680 liters) located in my dining room. It had two overflow boxes, one in each back corner. 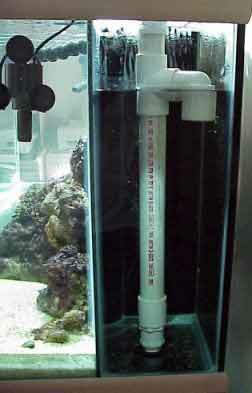 The aquarium came with a perforated pipe (a tube with hundreds of holes in it) inside the overflow chamber. This allowed the water to flow into the pipe quickly. However, this also meant that the water level in the overflow chambers was very low — about 3 inches (8 cm) deep. With such a low water level, water entering the overflow chamber had about a 20 inch (50 cm) drop! This sounded like Niagara Falls with about 1,500 gallons (5700 liters) per hour enter the overflow chambers. Secondly, each chamber made a gargling noise — sounded like a toilet flushing 24 hours a day. It was so loud my wife could not sleep. I had to fix it fast! Little to no water fall. Whisper quiet, no splashing or gurgling. Each chamber becomes a refugium. Chambers will not drain in a power outage. Pictured to the left is the very first Durso Standpipe™ ever made. It is the original prototype I tested. The current design is slightly different with an operating water level a few inches higher. Amazing! excellent site with excellent info, the whole world is benefiting from your findings... Thanks a millions! !